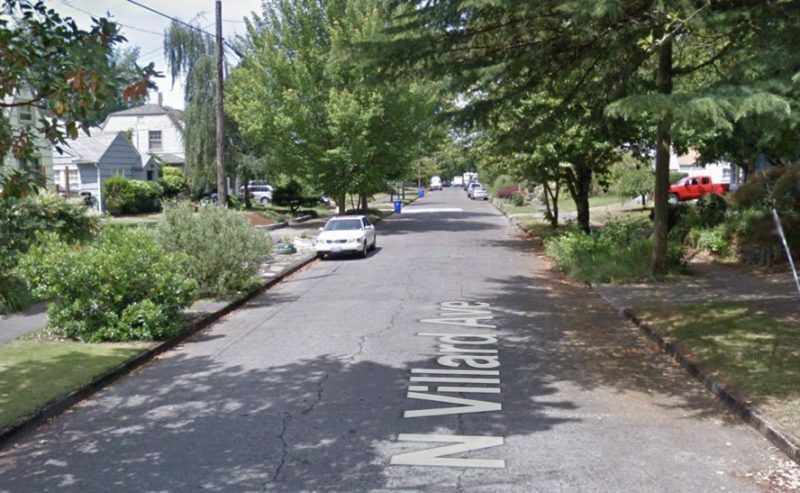 Simmering tensions about dangerous drivers who cut-through north Portland’s Arbor Lodge neighborhood have reached a new level. 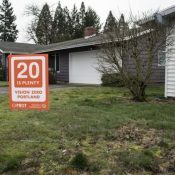 According to a post and photo on Nextdoor, someone defaced around 40 of those orange, “20 is Plenty – Vision Zero Portland” signs on Saturday night. Has an anti “20 is plenty” backlash begun? 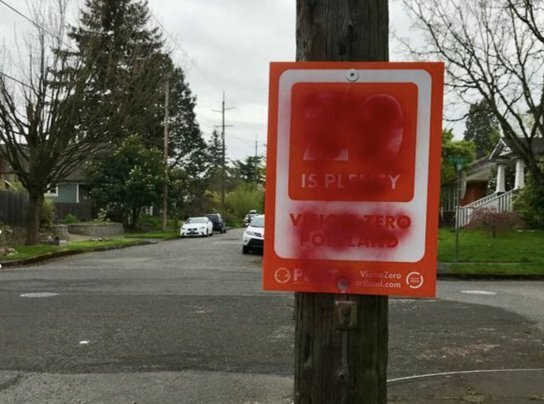 Last night somebody removed or spray painted over all the “20 is plenty” signs from Villard and Rosa Parks through Willamette and Greeley. That was probably about 40 signs. Who are these midnight marauders? Are they the beginnings of some sort of “pro cut-through” resistance group? All of us living on these residential side streets, especially the small children, seniors, and those with pets are ready to hear you out. The Portland Bureau of Transportation has been handing out the signs for over two months now at numerous events throughout the city. They are part of an effort to change the culture around speeding. The response to the free signs has been so positive that PBOT is now limits how many people can take. I’ve seen residents in neighborhoods from Lents to Linnton blanket their yards and streets in an effort to get people to slow down. Villard is a quiet, tree-lined street. Why on earth would anyone be against lower speeds here? In Arbor Lodge, North Villard Avenue is a flashpoint in the battle against cut-through commuters. The north-south street is very popular for people trying to avoid traffic on Greeley and I-5. According to Nextdoor post, signs were vandalized along the entire cut-through route. Back in October, I attended a meeting of Arbor Lodge residents who came together with their neighbors in Overlook to coordinate efforts at improving street safety. Cut-through traffic was the hottest topic and Villard Ave. was the most often cited location of speedy short-cutters. Residents and activists want the City to install median and diversion measures to keep drivers out of their neighborhoods. This act of vandalism will likely only strengthen their resolve. The incessant reckless speeding in Arbor Lodge is mind boggling considering the amount of children and families on the streets here. 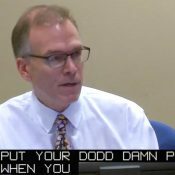 PBOT, BDS & Portland PD don’t seem to mind mind the fact that people cruise well over the 30mph limit on Greeley, Rosa Parks and Willamette. These are residential streets as well that need speed mitigation. Unfortunately It’ll probably take more pedestrian deaths to get attention, if at all. Perhaps it is an unhappy resident who have already had to give up their parking space close to home, and now this. Sometimes we get knee jerk reactions instead of real action and this is their way of showing anger. Hopefully, whoever did this will think twice the next time, as the sign is there for a purpose and it is to protect our babies, families and pets. It wasn’t me, but I bet most of the people that put those signs in the yard go more than 20 mph. I have consciously tried driving around N Portland going 20 mph and it is too slow. I’m not driving like a maniac, but I don’t see why 25 is such a big deal. 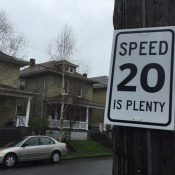 For the past few years, PBOT has slowly but surely ratcheted up their war on speeding. It’s essential work. And the fact that someone reacts to it like this, shows that it’s having the desired response. That is, we can’t expect significant culture change to happen without some people getting uncomfortable. Surely some video will surface that might give a clue to the vandals identity. I keep my sign up in the yard unless we’re outside, when I’ll put it out on the curb. I’m really hoping for the best in the “20 is plenty” campaign, but stuff like this really brings me down. People are willing to risk injury and death (for other people it should be pointed out) so that they can get to their destination sooner. It’s bonkers. The PR campaign is nice and worth and shot, but we need traffic calming infrastructure changes. More diverters on greenways and streets like Villard. Please stop posting and driving. A stable genius, no doubt. i saw some of these this morning – however i also saw a handful of signs (on the same block) that had been spray painted saying ’20 is law’, seeming to support the speed limit change. looked like the same color paint (i think) as the ones covered over. We are a very divided, polarized society. Facts mean less and less. We know the freewheeling 20th Century is gone forever, and now we’re starting to face the music. less than a mile from here, Greeley widens to 4 lanes before ramping on to the freeway or merging with I-5. This wide, 4-lane section is just over a mile long, and PBOT is re=paving and re-striping. They have monitored the speeds and found the the median traffic speed is 56/59 for this section! Their solution? 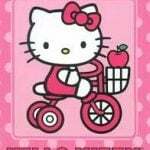 Move bikes off the road, then widen the lanes! The outside lanes will be 12′ and 13′ wide! What should expect cars to do on a road with lanes that wide? Drive fast as hell! And what do they do when hit the home-lined neighborhood a mile later? keep going? I applaud PBOT for this campaign, but simply ARE NOT doing the work to address speeding and dangerous infrastructure. Greeley, being a major truck route to Swan Island, is quite appropriate for a separated bike facility – what you call ‘moving bikes off the road’. Greeley is not a neighborhood collector street. Greeley feeds directly into the Overlook and Arbor Lodge neighborhoods. It is a primary route for people on bikes, in cars and on the bus between these neighborhoods (and neighborhoods farther north) and downtown. Truck traffic from Swan Island joins Greeley at Going. However, rebuilding the road to promote higher speeds than 56/59 is irresponsible of PBOT. Many of those drivers heading north will not slow down adequately. Also, collisions at those speeds are very dangerous for people driving. Also, PBOT is just moving bikes off the road. They are providing a 12′, jersey barrier protected MUP (which is great) for 2/3’s of the distance between Going and Interstate. The final 1/3, however, will be an unimproved concrete walkway that is less than 10-feet wide, is currently used as a driveway by the CIty and the Hazel grove residents(no plans to restrict vehicles) and connects to Interstate via a single curb cut into a 5-foot wide bike lane (not adequate for 2-way bike traffic). Heck has no fury like a Vancouverite forced to get home late for Wheel of Fortune. Wheel of Fro-Tune sounds delightfully funky. 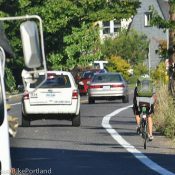 I live and work in Vancouver but am in Portland or other Oregon locations a couple times per week or more advocating for safer roads in your neighborhoods and commercial areas. I do believe I’ve made SOME impact on safety and yet I can’t even vote there. I know the sad reason you are so dedicated to making our streets safer, and I really appreciate all of your efforts. Thank you. Well, there will always be a few outliers. Remember when someone vandalized Biketown bikes. The neighborhood or a group like BikeLoud should line up that street with even more signs. EVERY time they are defaced replace them with more signs until the perp understands how seriously people are taking this issue. Just try getting more of them, and then try to get enough for an advocacy group to blanket any area. I have been unable to get even one. The 40 mph speed limit sign up the street from me has graffiti all over it… I would not read too much into this unless the same exact thing happens again somewhere else or at the same location. Weird stuff happens late at night on weekends. I have no idea why someone would do this. If they don’t want to drive 20, why deface the signs? Why not just drive at the speed they want to? I think the motive may have been something different, like a reaction to “new Portland”, or the sense that advocates are gloating with the signs or something like that. In the Age Of Rump, every topic is a potential weapon in a Culture War. It’s been going on much longer than that. Culture Wars, yes, but I think the field has opened up of late. Now most any semiotic exhalation may be interpreted as a slight. HK, usually when I run into people who are angry about stuff like this I ask them “what’s been taken from you?” But in this case, it’s obvious: seconds! maybe even a minute or two. EGADS! I don’t think that’s it at all. I think what people (might) feel has been taken from them is their city; this might be a similar reaction to N Williams, a sense that “our city” is being taken from us by the huge influx of newcomers, leaving no room for “us”. These signs are all going to be in the trash in 6 months anyway, so it’s pretty mild as vandalism goes. Good point and I agree. They still think they are losing something. I was thinking in terms of the immediate, when behind the wheel. Nothing sets people off like impatience. – helmet : speed limits aren’t actually very symmetrical. Though you may be right that the people in question missed that distinction. We need a Keith Haring “Crack is Wack”-style campaign! This traffic safety vandalism could also be a movement protesting that even 20 MPH is too fast for these targeted streets…15 MPH is much more appropriate from a livability and traffic safety standpoint. ¯\_(ツ)_/¯ I get where you’re coming from, but I see it less about “politicizing” it and more about evangelizing and crowdsourcing the public outreach by PBOT. I know carheads that know about this now — they had no idea it was coming despite us BP readers knowing about it for quite a while. I get where you are coming from, and evangelize makes my argument all the more relevant. Sad that in a world of information over reach motorists have to learn about new laws is such a banal manner. I respect your view, I just see it differently. None the less, I try to drive smart, defensively, and courteously. It’s easy to figure out who’s causing “traffic” — just listen to where the complaints are coming from. People often don’t like to hear the us vs. them ideas but that isn’t inherently a bad thing because as I was taught you can agree to disagree. One group somehow thinks that 20 is plenty is going have a savior effect on their streets while the other thinks it’s purely lip service and won’t matter until it comes time figure out how fast someone was driving when they hit any object. I called the mayor days before they voted for this “law” and was told that the mayor was going to add more overtime for cops to sit in neighbors to help enforce. 2 weeks in and I still haven’t seen a cop in the 7 miles of neighborhood riding that I do each way to work and beyond. My curiosity led to me calling the mayor again today and ask if what they said weeks ago was still going to actually happen. Tremaine, the mayors somewhat rude receptionist, said that we now have to call it in when someone speeds down our street and they will send out a unit to assess what they will do. Nothing has changed on the three streets that I see when I walk out more door everyday. So yes, it is lip service for me. Also, we have yet to mention anything about the illegal posting of said signs on telephone poles. I think some signs aren’t a solution but they can bring people together and help individuals who maybe feel they’re alone with their opinions. Diverters, diverters, diverters. That’s what it’ll take. The people with these signs now know where the others wanting the same thing are and can use that to start a movement to push for diverters. Soren, using data from a couple of sources, estimates are that very roughly 10,000 housing units in Portland are vacant! Some are vacant units in new apartment developments, what are having trouble leasing up. But many are older (not brand new) units that are being off the market due, I and others believe, to investor activity. This problem is so bad in some cities that we are starting to see taxes on housing held vacant. Paris, Vancouver, etc. most of these apartments had young voters (VAN data) during the last election cycle. anecdotally, i’ve never seen anything like this during previous election cycles. it would not surprise me to see a significant drop in cycling mode share in inner neighborhoods in coming years. I don’t know what VAN data is, but that sounds bad. Signs R Good. More speed bumps and traffic diverters would be great, too. Pretty exciting to see these signs succeeding at getting people out of their cars (even if it’s to spraypaint the signs). Why is it too slow? Is it taking a lot of extra time driving through neighborhoods? Besides, we can be pretty sure a 20 MPH limit means tons of people are going to go 25 or 30 anyway, which is at least better than 30-35. I completely agree that 20 feels slow as molasses when driving. However, I’m willing to acclimate in the service of not maiming/killing people. I’m disturbed that others — particularly others who live in my neighborhood — are not. When driving 20 in my neighborhood, I’m much more inclined to roll down the window, and scan side to side for potential objects/creatures who might enter the road. It’s a good way to occupy your mind, practice ‘protective driving’, and just enjoy where you are. 20 is too slow because in modern vehicles it’s halfway between pressing on the gas pedal and not. In my ’83 Nissan, 20 is easy cruising in second gear, and it feels plenty fast. Sounds like there’s an easy remedy that you’re missing. The risk of a fatal outcome hitting a pedestrian at 25 mph is about 30%. At 20 mph its just over 10%. About 3 times the risk of killing someone is the reason why 25 is such a big deal. Someone removed the 20 is plenty sign I placed at 23rd/clinton. 50mp seems to be the new speed for cars on both the Burnside and Morrison bridges. Lived on Atlantic for 13 years… The cut through traffic was a big reason I moved. Atlantic gets way more morning cut through traffic than Villard, but Villard is a more narrow street. Atlantic is wider and traffic tends to go much faster through there. PBOT really needs to put a no turn on red for vehicles turning right onto Southbound Greeley from Killingsworth. Otherwise the Atlantic cut through often offers a significant advantage to Greeley. Good luck! I put up a sign on 23 + SE Clinton. It was shortly removed. Good thing 20 mph is now the law…but only if is enforced. Otherwise it’s like a “please don’t pee on the toilet seat” sign at a fast food joint. Speed signs and bathroom signs work on me, both affect those that follow me. This is generally my sentiment on the frustration – nothing reminds one of their own finite mortality like moving out to survive, facing increased commute times, and lowered speed limits. Doesn’t justify it, but I can’t not sympathise, having an hour commute one way to work. Part of traffic calming is breaking this millenia-old relationship where the untouchables in the sticks shuffle into the metropolis to serve their trendy leader-preneur Brahmans. Not long ago, it was the untouchables stuck in the inner city serving the brahmins who came in from their suburban paradise. People resisting authoritarianism, that’s crazy!